Luang Prabang is my favourite destination in Asia for just casually strolling around. With a scenic backdrop, gorgeous architecture and temples to explore one ought to never get bored; however, aside from the main touristy spots I’ve found the local markets fascinating. 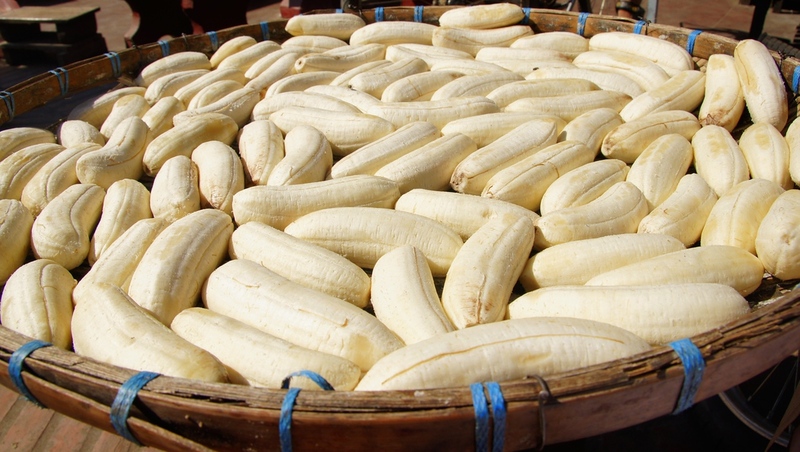 This particular photo is of a basket full of bananas being set out to dry in the sun. Dried fruit and vegetables are popular not only in Laos but throughout many areas of Asia. For photographers, it is great to fill the frame whenever possible. In this particular photo you’ll notice there is very little negative space. I’ve achieved this result by cropping the photo to only include the bananas and the basket. One can fill the frame with the initial exposure or (as mentioned in this technique) by post processing afterwards. To view the rest of my travel gallery from Luang Prabang, Laos click on the photo. Yum bananas! Great photo Samuel – Luang Prabang is my favourite place in Asia so far as well. I could wander the streets for weeks and never get bored. I would actually like to go and stay there for an extended amount of time at some point. Dean, I feel exactly the same way. I could imagine basing myself there for week/months on end. All I would need is a decent internet connection and I’d be all set. I just feel my blood pressure drop when I go there from say Bangkok.